Compactness is the new name of the game. Look at our cell phones, computers and many more things we use every day. It's all about packing in more in the smallest of sizes, so why should our SUVs remain large and burly, unnecessarily? Which is a reason why compact SUVs enjoy immense popularity today. And as one of the largest car makers in the world, how can Volkswagen not have a compact SUV in its arsenal? Which is why, the T-Cross. The compact crossover broke cover at gala events at three different locations across the world simultaneously, in Amsterdam, Shanghai and Sao Paulo last October, marking its importance as a global product. 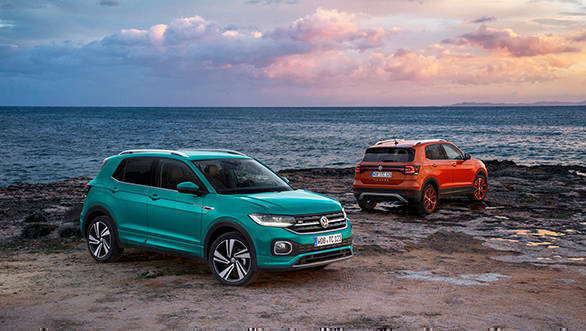 Goes without saying, the T-Cross is the next big thing for Volkswagen for the Indian market too. In fact, the T-Cross will be the Volkswagen brand's first offering in India as part of its 'India 2.0' strategy. And why not  we've seen a steady influx of compact crossovers over the past couple of years, though the Hyundai Creta is pretty much the name to beat. It has been bringing big volumes for the Korean car maker with its design, comfort and equipment levels. Coming back to the T-Cross, I was present at its global unveil in Amsterdam and was impressed, as the T-Cross felt premium, upmarket, youthful and all that. In addition, the display vehicle boasted equipment levels unheard of in the compact SUV segment. Fast forward to March 2019 and I flew to the Spanish island of Mallorca to drive it. First things first though, the T-Cross you see here is the European-spec and will go on sale there shortly. The Indian version will be different. In fact, in all probability it will get a new name for India! It will also be slightly longer than the European version (which is 4,235mm long) and possibly taller too. The Indian version is also expected to get slightly more flared wheel arches and few other design changes for a more muscular stance in keeping with Indian tastes. That said, the European T-Cross has a very chic appeal to it. It looks upmarket from end to end  the front end looks chiseled thanks to the way the headlamps are styled while the matte black grille offers a rugged feel along with the faux skid plate (on the R-Line trim only). The T-Cross looks boxy from the sides like a traditional SUV, while its tall ground clearance adds to the SUV-esque stance. The black cladding on the wheel arches tries to add a muscular feel, but I felt the wheel arches could have been slightly more flared. That said, I also liked the shoulder line and character lines on the side, which make for a rugged stance. 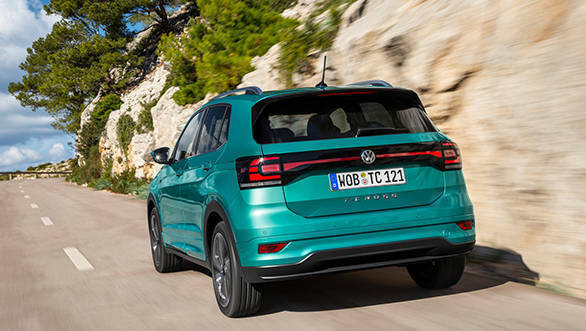 The piece-de-resistance as far as the styling is concerned is the rear end though  the tail lamp design is appealing, yes, but more importantly it's the black strip across the boot connecting them that makes for a very premium appearance. This is a design trait we have seen on the Porsche Cayenne and makes for lots of road presence on a compact crossover like the T-Cross. Interior design and layout are a standard Volkswagen affair, albeit in a more modern form than we see on its cars in India. There's tonnes of customisation options for the dashboard to make it look livelier, in case you don't like the standard black. Body-coloured inserts and mood lighting enhance the appeal further and also offer a youthful vibe. The star of the show here are the two large screens, particularly the 8 inch 'Active Info Display' that replaces conventional clocks. Like we have seen in Audis, you can customise what you want to see and have the option to choose from the regular speedometer and tachometer or use navigation in a wide screen format or simply get vital numbers on the screen. The all-glass touchscreen for the infotainment system is just like the one we've seen in newer Skoda cars. Equipment levels in our T-Cross were top notch including two front USB ports, two rear USB ports, a wireless charging pad. The audio system is a Beats-sourced, 300-watt sound system with an 8 inch amplifier and integrated subwoofer. But what really impressed me was the radar-based stuff like lane assist, pedestrian monitoring and front assist, all of which are standard across variants for Europe. There's additional equipment that can be configured as well like blind spot detection, rear traffic alert, driver alert system, adaptive cruise control and park assist. That is a lot of options for a compact crossover and most of this isn't stuff you won't even expect in the segment! Space management is excellent  the cockpit is roomy given the overall width of 1,977mm, but what impressed me more was the space at the rear. At an inch under six feet tall, I had good leg and kneeroom at the rear, even with the driver's seat set to my height. 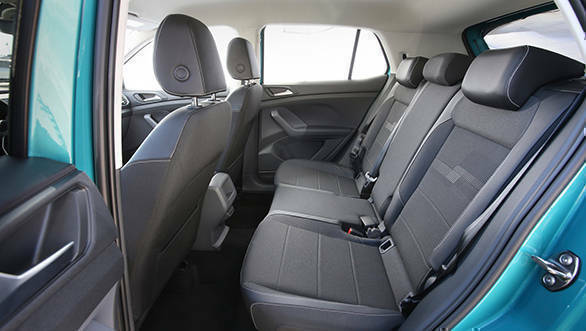 The 60:40 rear bench can also slide forward or backward to adjust luggage space and available boot space with the rear seat up can thus vary from 385 litres to 455 litres. We only drove the petrol version powered by Volkswagen's three-cylinder, 1.0 TSI engine. The engine is on offer in two states of tune  95PS and 115PS. There's a 1.6 TDI on offer in Europe as well but we stuck to the 115PS petrol, as Volkswagen is most likely to skip the diesel option for India, initially at least. The T-Cross will effectively mark the 1.0 TSI motor's debut in India. The three-pot motor can be had with either a six-speed manual or Volkswagen's seven-speed DSG in the T-Cross. We drove both and it was interesting to note how different the crossover felt in both forms. The DSG tries to offer a sporty feel by the way of paddle shifters but I found it best to let the gearbox choose ratios. As for the engine, it feels peppy and is quick to respond to throttle inputs, while turbo lag is near non-existent. Acceleration is brisk and the T-Cross was quick to make progress on Mallorca's traffic-free roads. Initial grunt and midrange punch are impressive though the engine did feel stressed as I closed in on the redline and was accompanied by a slight hint of vibration from the floor. That said, engine performance is adequate and there was nary a moment when I felt the need for more punch or a bigger motor. The DSG goes about its job with aplomb but feels slightly boring. In comparison, the manual version of the T-Cross feels more engaging to drive as it lets you eke out engine performance better. The six-speed gearbox also offers slick shifts and even eggs you to push harder. 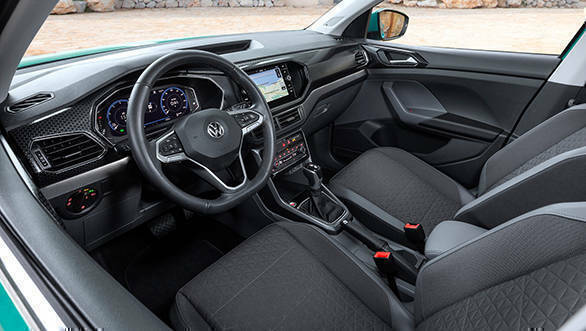 The T-Cross's handling felt familiar  it has the precise feel Volkswagen's cars are known for. The suspension setup is firm, while the steering offers good feel and feedback, adding to the engaging feel. Our test vehicle was running on 18 inch rims shod with Pirelli rubber which added to my confidence on Spain's well-paved roads, allowing me to explore the crossover's sportiness. 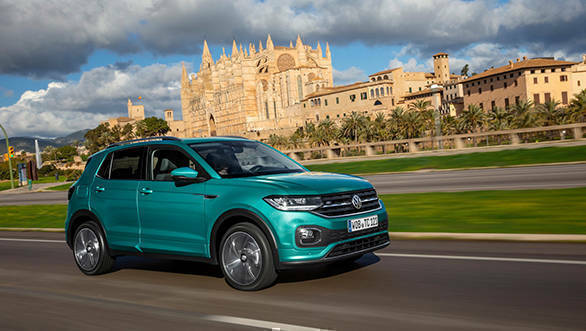 Needless to say, the T-Cross is based on Volkswagen's MQB-A0 platform which is a derivative of the MQB, which explains its impressive handling. I expect the Indian version, which will be based on the - more specific to India - MQB-A0-IN platform to offer a similar feel and impress on the ride and handling front. There is no all-wheel drive version on offer currently, but the ample ground clearance should allow you to tread off-tarmac if needed. To sum it up, the T-Cross does possess the fireworks for it to carve a new niche for itself. It will be launched after its cousin, the Skoda Kamiq. The compact SUV segment, which is not only immensely popular today but is also teeming with interesting options already should thus witness even more intense competition next year. 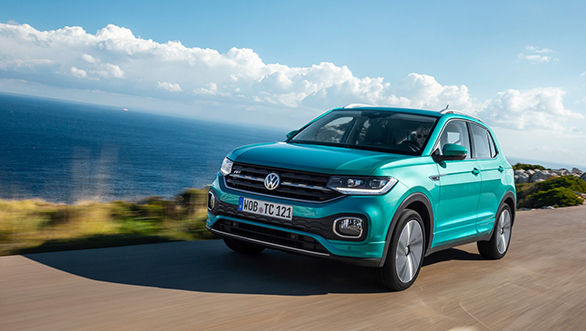 Like I mentioned at the start, this is the European spec T-Cross and I expect the Indian version  likely to be out mid-2020  to offer slightly plusher ride quality without sacrificing the likeable handling characteristics. It is more or less confirmed that the 1.0 TSI engine will power the Indian version, in its higher state of tune. More importantly, we expect it to come equipped with class-leading technology and features including the all-digital instrument cluster. We expect it to be priced well too  prices could begin around the Rs 10 lakh mark and go up to Rs 15 lakh, which should help it bring Volkswagen right back into the volumes game.